Category: Disabled Signs, Informations Signs. Looking for signage solutions? Classic Sign is the leading provider of self-adhesive stickers and signs for use by businesses and individuals. Our broad range of warning and information signs is complemented by a wide selection of Disabled Cling Signs, perfect for informing your clients and the general public about disabled advice, warnings and restrictions, whatever the setting. Our range of ten Disabled Cling Signs includes reversed-out Blue Badge holder and Wheelchair symbols as well as a standard Wheelchair symbol, Disabled wheelchair symbol, Blue badge holder, Disabled blue badge holder, Wheelchair access required at all times, Please leave room for wheelchair access, Keep your distance and Disabled blue badge holder on board sticker. 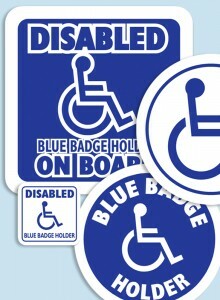 Disabled Cling Signs are self adhesive and can be applied to any clean, dry glass surface. They are equally suitable for use in public or private buildings and in motor vehicles, with several designs formatted specifically for use on the road. Classic Sign has been selling Disabled Cling Signs for over a decade and they remain one of our best-selling items. Customers from the UK and all over the world choose them for their eye-catching format, high quality finish and competitive pricing. Order yours today and don’t forget to check out our other vinyl signage options for use in your business or your home.